Are you keen to take good photographs with your camera or phone, but are not interested in the intricacies of aperture, shutter speed, ISO, depth of field etc. etc. that us techies (yes, I’m definitely in that category!) get so absorbed in? If so, then this article (the first of a series) is for you. The focus (sorry) will be on providing some tips on good composition. Alignment: Are your horizontals horizontal and your verticals vertical? Granted, there may be instances where you don’t want them to be but generally you really do not want, for example, a great seascape shot ruined by the horizon markedly sloping to the left or right or a building listing drastically, or maybe an upright Tower of Pisa! So, before you press that button just take a few seconds to check the alignment. Many cameras include frame markers within the viewfinder or screen – you can use this to help. Appendages: Another basic check is to make sure that your main subject has not acquired an unwanted appendage – I’m sure you have all seen shots where trees or lampposts appear to grow out of someone’s head. Often it just needs a slight change of position of either the photographer or the subject. Distractions: It is very easy whilst concentrating on your main subject to include in your shot objects or people that you don’t really want, so again maybe a change of position is needed, or perhaps just wait a few seconds for a passing person, car etc. to move out of shot. This is a well-known and well-used technique in photography to help with composition. Imagine a view with a grid superimposed on to it such that it is split into three equal sections horizontally and three equal sections vertically (like a noughts and crosses grid). The idea is then to place any major elements in the image along these lines and preferably at the points of intersection. 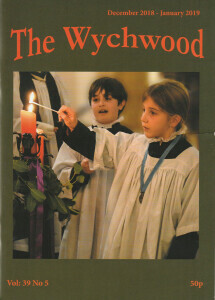 Have a look at the image on the right. The balloon has been placed on the intersection of the left vertical and bottom horizontal gridlines. Additionally, the horizon has been placed along the upper horizontal. 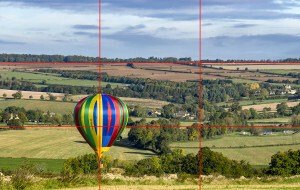 Generally, this technique will produce a more pleasing image than one where the subject has been placed centrally or the horizon is placed across the centre. Despite its name however, the Rule of Thirds is only a guideline – there are no rules in photography – try it out for yourself and see what you think.